Do you hate writing grocery lists? So do I. It takes forever to come up with dinner ideas, make a list of ingredients, and organize them by aisle at the grocery store so I’m not wandering around like a crazy lady. 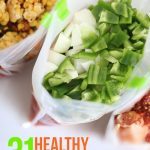 When I started making crockpot freezer meals I shared my recipes and grocery lists on this blog so you could use them too. 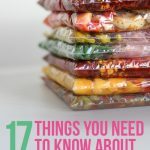 After sharing more than 50 free printable grocery lists with freezer meal prep sessions I thought it might be helpful to highlight some of my favorites in one place. If you click the name of the prep session below you’ll find the original blog post with its free printable recipes and grocery list. Enjoy! 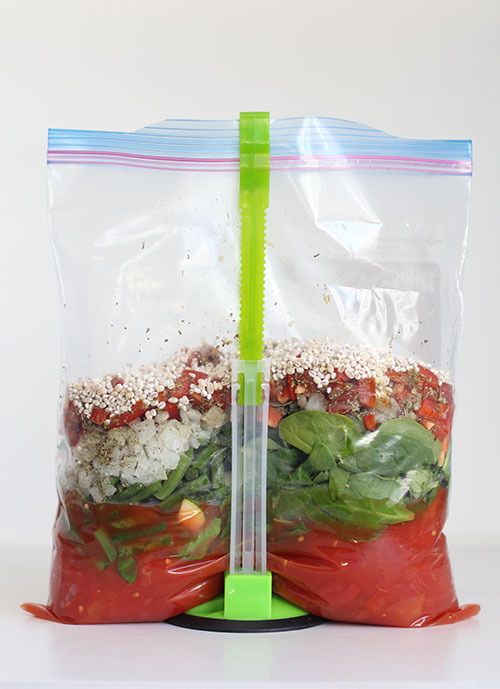 5 Healthy Crockpot Freezer Meals with Tomatoes in 75 Minutes (made with fresh diced tomatoes). The recipes in this session substitute fresh diced tomatoes for canned ones. They’re healthy and delicious and perfect to make in the summer when tomatoes are ripe in your garden, farmer’s market, or local grocery store. 6 Healthy Crockpot Freezer Meals in 45 Minutes (every recipe includes a veggie). I made these freezer meals when I was 9 months pregnant with my 4th baby and sick of eating take-out. I focused on simple recipes with six ingredient or less and made sure each one included a vegetable. 6 Healthy Crockpot Freezer Meals in 50 Minutes (no condensed soup or added sugar). 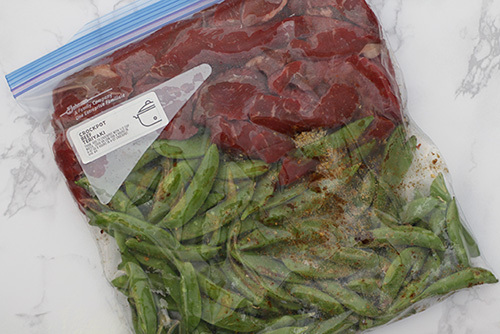 This is one of my most popular freezer prep sessions because it was featured on BuzzFeed. 8 Healthy Crockpot Freezer Meals in 75 Minutes (lots of fresh vegetables). This is one of my most popular freezer prep sessions. 8 Crockpot Freezer Meals from Whole Foods in 35 Minutes (organic frozen vegetables). I only spent $92 total on ingredients, which is awesome because these meals are packed with healthy and organic ingredients. 10 Organic Crockpot Freezer Meals from Costco in 60 Minutes (all organic ingredients). It was a challenge to make all organic meals from Costco, but I did it and only spent $130 on ingredients. 6 Crockpot Freezer Meals in 1 Hour (Only $4.40 per meal!). I challenged myself to save money during this prep sessions by focusing on lower cost meats/veggies and common spices that I have on-hand. The total cost was only $26. 6 Crockpot Freezer Meals in 50 Minutes ($5 per meal). These recipes feature common ingredients that you probably already have in your kitchen, like onions, frozen corn, and spices. 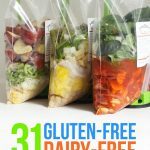 5 Vegetarian Crockpot Freezer Meals in 50 Minutes ($6 per meal). We’re not vegetarian, but I was able to adapt some of our favorite recipes and save money too. 12 Crockpot Freezer Meals from Costco in 75 Minutes ($7 per meal). Buying in bulk is perfect for crockpot freezer meals and these recipes take advantage of Costco’s good deals on produce, beans, canned organic tomato sauce, and meat. 6 Crockpot Freezer Meals from ALDI in 40 Minutes ($7 per meal). These recipes were inspired by ALDI’s great deals and organic food. Yum. 5 Crockpot Freezer Meals in Under an Hour ($7 per meal). My friend Kayla made these meals and I love that the recipes are so simple and affordable. 6 Chicken Crockpot Freezer Meals in 30 Minutes (chicken breasts). These recipes are super healthy and don’t include any processed foods. Don’t tell anyone, but we liked them so much I included them in one of my Crockpot Freezer eCookbooks. 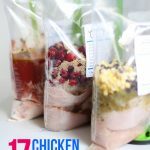 7 Chicken Crockpot Freezer Meals in Under an Hour (chicken breasts). This is a great group of recipes to make when chicken breasts are Buy One, Get One at the grocery store. 5 Ground Turkey Crockpot Freezer Meals (ground turkey). These meals were inspired by a 5-pound package of ground turkey that I bought at Costco for $2.79 per pound. Healthy and budget-friendly. 6 Ground Beef Crockpot Freezer Meals in 50 Minutes (ground beef). I add ground beef to my crockpot raw and it always turns out great. These are the perfect meals to make when you get a good deal on a 3+ pound package of ground beef. 3 Ground Beef Crockpot Freezer Meals in 30 Minutes (ground beef). I made these meals for my grandparents last month. They were delicious and affordable. 6 Beef Crockpot Freezer Meals in 40 Minutes (beef chuck roast). Beef chuck roast is my all-time favorite meat to cook in the crockpot. It’s tender, flavorful, and affordable too. We make these recipes over and over again. 6 Meatball Crockpot Freezer Meals (meatballs). I LOVE Costco’s 6-pound bags of frozen meatballs so I used them in these freezer meals. They were super easy to make and delicious. 7 Crockpot Freezer Meals in 30 Minutes (4 minutes per meal). This was my fastest freezer prep session ever. I saved time by focusing on recipes with only 3-6 ingredients, but made sure every one included a vegetable. Yay! 8 Crockpot Freezer Meals in 35 Minutes (4 minutes per meal). I like to double recipes to save time and money, but this session focused on recipes that work with different types of meat so we could have variety too (for example, one bag of chili made with chicken and a second one made with ground beef). 10 Healthy Crockpot Freezer Meals in 60 Minutes (6 minutes per meal). My goal is to always make consistently make 10 meals per hour and I hope to capture it on video some day. 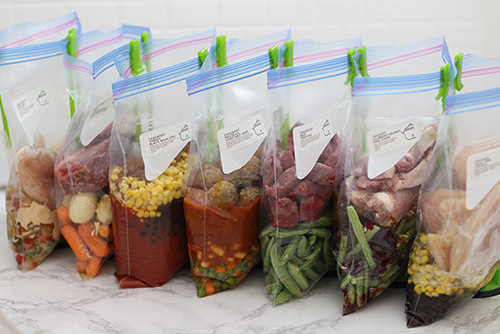 To help save time with these meals, I used spice packets and fresh vegetables that can be added to the freezer bags as-is (like baby carrots and spinach) and frozen vegetables. 6 Make-Ahead Freezer Meals in 50 Minutes (8 minutes per meal). In addition to crockpot freezer meals this freezer session includes a recipe for “no-cook” meatloaf too. Simply combine the ingredients raw in a loaf pan and freeze. All of the time estimates above include clean-up, because there’s no point in working fast if you have to spend an hour cleaning up your kitchen afterward. I’m gearing up for nursing school, which starts in about a week and a half & I’m finding your recipes so useful to prep meals ahead of time, so that with my kids’ activities, my own studies and life in general, dinner will be one less to think about. I can’t wait to try them all. Thank you so much!